Elvis, The Best Of British - The HMV Years 1956-1958 by Trevor Simpson and Pål Granlund. Memphis Going Down; A Century of Blues, Soul and Rock 'n' Roll by James L. Dickerson. Blue Star Love: From an Amazing Heart of Grace by Maia Chrystine Nartoomid. Elvis On Tour 1970: Volume 1 - Back On The Road by Kieran Davis. When Elvis Met Nixon by Igor Kultina. Elvis Memories - The Real Elvis Presley by Those Who Knew Him by Michael Freedland. The Elvis Files Magazine Issue 3 by Erik Lorentzen. The Elvis Files Vol. 1, 1953-1956 by Erik Lorentzen. Elvis Presley, The Summer of '61 by David English, Keith Russell, Pål Granlund and Ernst Jorgenson. The Million Dollar Quartet: Jerry Lee, Carl, Elvis & Johnny by Stephen Miller. Elvis Presley, Histoires & Legendes by Daniel Ichbiah. Elvis Died for Somebody's Sins But Not Mine: A Lifetime's Collected Writing by Mick Farren. My Memories Of Elvis by Jo Anne Truiett Phillips. The Colonel: The Extraordinary Story of Colonel Tom Parker and Elvis Presley by Alanna Nash. The Ear Of The Heart: An Actress' Journey from Hollywood to Holy Vows by Dolores Hart and Richard DeNeut. King Creole by Joseph A. Tunzi and Paul Lichter. Flip, Flop & Fly - St. Louis to Atlanta 1973-1976 by Joseph A. Tunzi. (Note: this book has the same ISBN number as the book "Elvis '69" by Joseph Tunzi !! Elvis 1956 by Alfred Wertheimer. Scotty and Elvis: Aboard the Mystery Train by James L. Dickerson and Scotty Moore. Elvis: An Illlustrated History by Sandra Forty. The Elvis Files Magazine Issue 4 by Erik Lorentzen. Elvis Presley For Kids by Sam Rogers. The Elvis Files Vol. 6, 1971-1973 by Erik Lorentzen. Spotlight on Elvis; The Photographic Work of Ed Bonja by Ed Bonja. 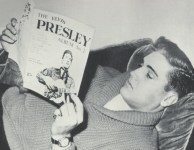 The Elvis Presley I knew: Beyond the headlines and scandal to the heart of the superstar by Robert C. Cantwell. Elvis Remembered: De Geautoriseerde Boxset met Archiefmateriaal uit Graceland by Gillian G. Gaar. Elvis, un Homme, toute la Musique, Vol 2 1968-1977 by Jean-Marie Pouzenc. Legends of Music: The Life and Legacy of Elvis Presley by Charles Rivers (Ed.). Elvis Presley by Adolfo Perez Agusti. The Elvis Files Magazine Issue 5 by Erik Lorentzen. The Seeker King: A Spiritual Biography of Elvis Presley by Gary Tillery. Little Book Of Elvis: In The Movies by Timothy Knight. Elvis Films Faq: All That's Left to Know about the King of Rock 'n' Roll in Hollywood by Paul Simpson. Elvis Music Faq: All That's Left to Know about the King's Recorded Work by Mike Eder. Elvis' Favorite Director: The Amazing 52-Year Career of Norman Taurog by Michael A. Hoey. Elvis, un Homme, toute la Musique en 2 volumes Tome 1, 1953-1968 ; Tome 2, 1968-1977 by Jean-Marie Pouzenc. Elvis. Król Rock'n'Rolla by Jerry Hopkins. Music Legends: Elvis by Timothy Knight. Essential Elvis by Peter Silverton. Elvis Presley intime: L'icone perdue by Jean-Pierre Danel. Elvis Presley: Erfenis van een Fenomeen by Edwin Wendt, Chris van Oostrom. The Elvis Files Magazine Issue 6 by Erik Lorentzen.